Number 5 and still counting! 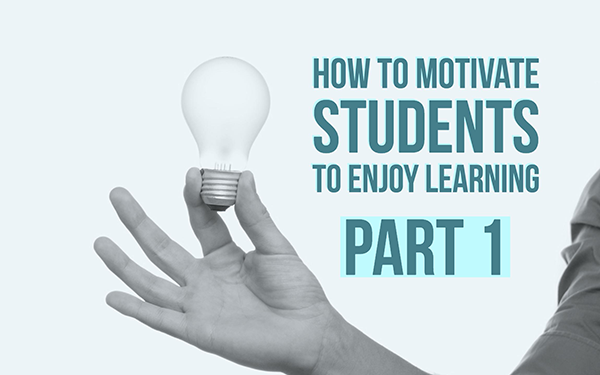 Yet again an interesting piece for this blog post series that answers one of the most important questions in education history: how to motivate students to enjoy learning? Reading the book “Why don’t students like school” by Daniel T. Willingham inspired me to write a short series of blog posts on this topic, summarizing the most important facts in his book. I highly recommend to read this book! Part 1: Why don’t students like thinking? Part 2: How can you teach students the skills they need when standardized test require only facts? Part 3: Why is it so hard for students to understand abstract ideas? Part 4: Is drilling worth it? In order to encourage your students to learn, we have to understand their brain and their thinking. How do they think? What do they think about? How does the student’s peculiar brain work? Analyzing and adapting to multiple learning styles in the same classroom is a burden on the teacher. That’s why it’s important to know the most important differences between students. 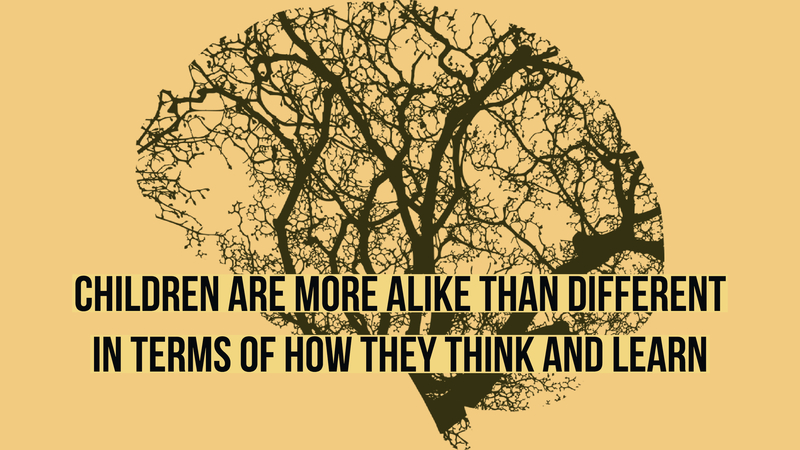 And surprise, surprise: children are more alike than different in terms of how they think and learn. It’s true that some differences in students seem so obvious. But are those differences as important for teachers as we think? Students have different cognitive abilities and different cognitive styles. Let’s dig a little deeper into the meaning of those terms. Cognitive styles: the bias to think in a particular way. For example: to think of one thing at a time (sequentially) or to think of all parts simultaneously (holistically). In short: how students prefer to think and learn. Cognitive abilities: the capacity for, or success in certain types of thoughts. For example: If I say: “Andrew has a lot of ability in French”, I mean that he tends to learn new French grammar and words quickly. In short: how students deal with content and they reflect the level of what we know and can do. Some students are structured, some love the chaos. Some students love challenges, others want simplicity. Some students are considerate, others impulsive. These differences are known to be opposites. And as it happens, it’s the same with cognitive styles. These are the cognitive styles psychologists have discovered up until now. Broad/ narrow Preference for thinking in terms of a few categories with many items versus thinking in many categories with few items. Analytic/nonanalytic Differentiate among many attributes of objects versus seeking themes and similarities among objects. Leveling/ Sharpening Lose details versus attend to details and focus on differences. Field-dependent/ field independent Interpreting something in light of the surrounding environment versus interpreting it independantly of the influence of the environment. Impulsivity/reflectiveness Respond quickly versus respond deliberately. Automatization/ restructuring Preference for simple, repetitive tasks versus preference for tasks that require restructuring and new thinking. Converging/ diverging Logical deductive thinking versus broad, associational thinking. Serialist/holist Working incrementally versus thinking globally. Adaptor/ innovator Preference for established procedures versus preference for new perspectives. Reasoning/intuitive Learning by reasoning or learning by by insight. Visualizer/ verbalizer Preference for visual imagery versus preference for talking to oneself when solving problems. Visual/ auditory/ kinesthetic Preferred modality for perceiving and understaning information. 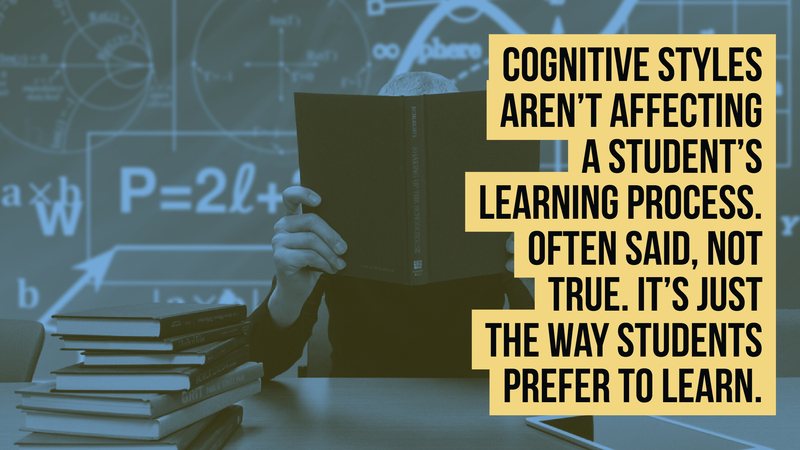 Remember that cognitive styles aren’t affecting a student’s learning process. Often said, not true. It’s just the way students prefer to learn. Here’s an example. Ricky is an auditory learner and he has to learn a presentation that’s auditory as well. So why doesn’t he learn better than other students in his class? It’s because the auditory information is not what’s being tested. That would be for example the particular sound of the voice on the tape. Now, what’s being tested, is the meaning of the words. And Ricky’s auditory memory doesn’t help him in situations where meaning is important. Something that is true: Students with different learning styles might benefit from different ways of presenting the same material. When students are learning addition, a visual learning might view grouping of objects, and an auditory learner might listen to sets or rhythms, and a kinesthetic learner might arrange objects into groups. But, again, this has no influence on the actual understanding of addition. It only changes the way to get there. There are a lot of tasks for which we use our minds. And of course, most of us are good at one thing, and bad at the other. Like being good at math, but being bad at attempting anything athletic. These are mental abilities, or as Gardner describes them: intelligences. Linguistic Facility with words and language. Logical mathematical Facility with logic, inductive and deductive reasoning, and numbers. Bodily-kinetic Facility with body movement, as in sports and dance. Interpersonal Facility in understanding others' emotions, needs, and points of views. Musical Facility in the creation, production, and appreciation of music. Naturist Facility in identifying and classifying flora or fauna. Spatial Facility in the use and manipulation of space. 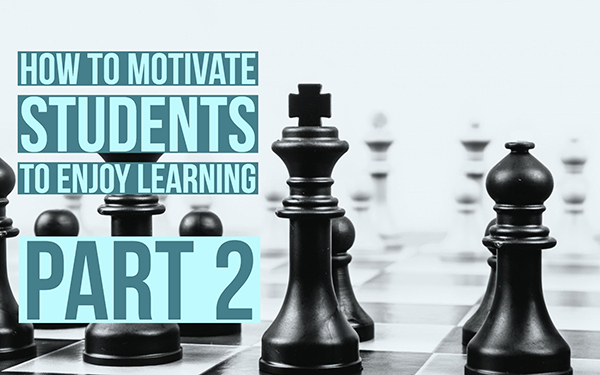 Here you have to take in that if a student is good at one task, and bad at the other, differentiating instructions won’t make a big difference. According to Gardner, a student will always be better at one task and worse in the other because students have different intelligences or abilities. So what do these cognitive styles and abilities implicate for in the classroom? One thing is sure: scientists won’t offer any help because they haven’t found particular categories of students that go along with varieties of instructions. So here’s a golden tip: treat students differently on the basis of your own experience with the student and watch out to what works and what doesn’t. In this case, crafting knowledge trumps science. Learning style theories can be useful when applied to content. You want students to experience material in one or other way depending on what you want your students to get out of the lesson. An organogram of a company should be seen and the national anthem of Belgium should be heard. The cognitive styles provide some new insights to think about lesson plans. Do your students have to focus on similarities among concepts or on the details that differentiate the concepts? Do they have to think deductively during a lesson, or to associate creatively? Think about this when wetting up a lesson: What will your students learn from your lessons and how do they get there? 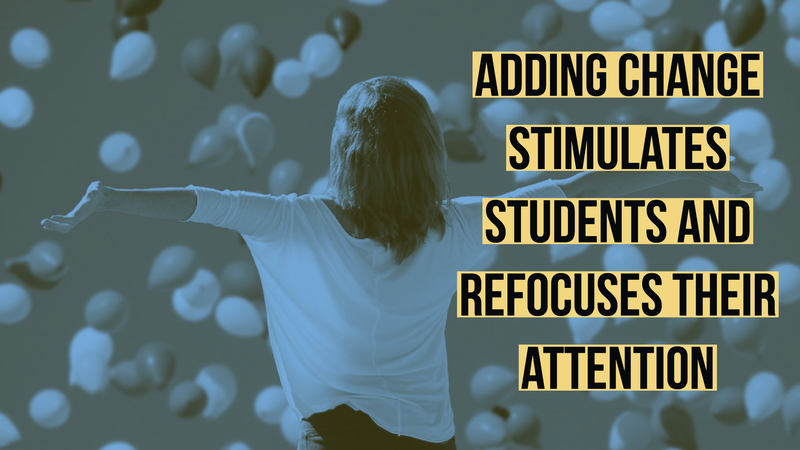 Adding change stimulates students and refocuses their attention. If you’ve been talking for a long time, perhaps a visual or a video might engage students again. If students have to do a lot of logical, deductive thinking, an exercise that calls for broad associative thinking might do the trick. Don’t individualize the required mental processes for each student, but give all your students practice in all of these processes. Look at it as an opportunity for each student to start fresh and refocus their thinking. It’s not necessarily the case that every child is smart in some way. You can’t measure intelligence. There will always be students who aren’t especially gifted in any of the intelligences. Every student is unique and valuable in some way, whether or not they are intelligent or have much in the way of mental ability. Don’t tell students “it’s just a skill you don’t possess”. Don’t tell a student, he or she is smart. Doing so, makes the student less smart. So, did you learn something new, reading this post? Let us know what you learned and tweet about it.